January | 2008 | The S.E.E.P. Shell Oil CEO Informs Employees That Peak Oil is an Estimated 7 Years Out! Van der Veer goes on to briefly and reasonably discuss the shortfalls of current public energy policy and renewables. Do you think they meant for this to become general knowledge? It’s time to ramp up our battery/hydrogen/cellulosic ethanol/wind/solar research, according to Shell, we’ll see a sharp increase in oil prices ($500/barrel?) by 2015! 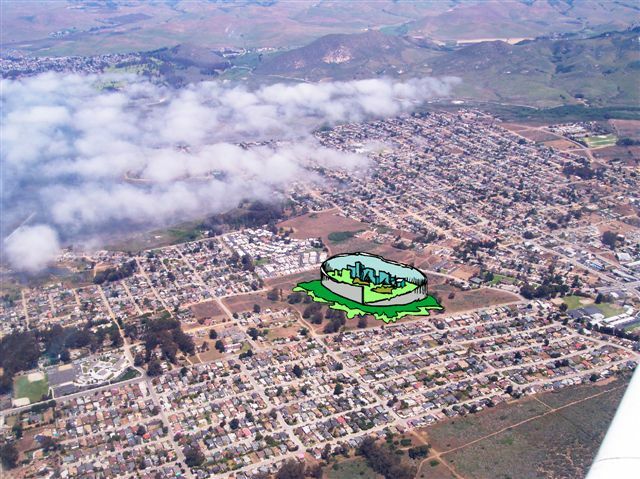 Sustainable Sewer for Los Osos, CA? San Luis County Surfrider chapter and SLO Green Build are co-sponsoring 2 public presentations and workshops in an effort to present environmentally and economically friendly ways to solve the small coastal town’s sewer problems. Currently everyone in the town, just south of Morro Bay, are on septic systems and no further growth is allowed since they have saturated the ability of the local ground to process the sewage. There are many members of the community that are fine with less growth, but also many who feel it would be good for the town, or those who stand to make a lot of money from development. So far, a waste treatment facility has been planned smack in the center of town, in a beautiful plot overlooking the ocean. The community has been outraged at the proposal, and a few million dollars in taxpayer dollars has been wasted in order to advance the agenda of a few. Los Osos, however, has the perfect opportunity to be a model community for sustainability. Instead of each citizen having to pay $30,000 or more to be hooked up to the new downtown sewage treatment plant in addition to the costs to the county for construction, each home could be retrofitted with composting toilets and greywater reclamation systems for less than that and in the process saving water and significant amounts of money in the long run, all while being better to the environment. Sounds like a simple decision, right? Not when there’s money to be had by local developers with their pocketbooks open for local officials. Well, it’s either that, or the planning board of Los Osos is seated with stubborn, backwards-thinking codgers with no vision or reasonable thought processes. Hopefully these presentations will educate and drum up enough public support for a well-planned, sustainable water and sewer plan for this unique and beautiful coastal town. Los Osos and other cities in our County…? Keynote Speaker: Jonathan Todd, of Todd Ecological Design Inc. (www.toddecological.com) an award-winning water and natural resources planning firm, will be visiting San Luis Obispo County on February 6th and 7th to address appropriate technology in San Luis county including the Los Osos sewer project. Todd Ecological specializes in the development of ecological technologies for food production, waste purification and conversion, environmental restoration and systems integration ofr architecture and eco-industrial parks throughout the world. The focus is to provide clients with cost-effective aesthetic solutions to wastewater, storm water, aquatic environment management, and bio-solids conversion. An AP report released yesterday showcased a study performed by 2 non-profit groups, the Center for Public Integrity, and The Fund For Independence in Journalism that documents the incredible number of false statements made by the Bush administration that led the public to acquiesce and go to war in Iraq. The study cites at least 935 false statements by Bush, Cheney, Condi, and Rumsfeld, 532 or more inaccurate statements by Colin Powell, Paul Wolfowitz, and press secretaries Ari Fleischer and Scott McClellan. Most of these statements asserted that there was unequivocal proof that Iraq did indeed have weapons of mass destruction and/or that there were proven ties between Saddam and Al Qaeda. The Center for Public Integrity’s “Iraq: The War Card” is a comprehensive database of this intentional deception by our government and shows without doubt that the Iraq war was brought about by a carefully orchestrated media and propaganda campaign designed to utilize the tragedy and outrage generated by the 9/11 attacks as fuel for the flame. The evidence has been available now for years and is growing in strength. So when can we start the criminal hearings for the Bush administration for fraud, deception, genocide in Iraq, and the almost 4000 wrongful deaths of our valiant U.S. soldiers that went to war to defend us from a lie. If the numbers for corn-based ethanol are so bad, why are we subsidizing this horrific waste of food when there are starving people around the world? It’s an environmental and social catastrophe. It seems that for many Americans, filling your SUV is more important than feeding a hungry family. I know that may sound harsh and unreasonable, but when you lay it all out, that is really the choice that we’re making. Who has the political guts to stop allowing corporate interests to dictate national energy policy and start making rational, well-thought out decisions that will provide us with energy security into the next century? Obama? Hillary? 6th Annual Mount Sinai Global Health Conference, “Environmental Crisis and Human Health”, 6pm, Friday, February 29th and 9am Saturday, March 1st. also wrote the new book, “Sustainable Healthcare Architecture”. This sounds like a fantastic conference but I unfortunately don’t think I’ll be able to make it out. The issue of human health and climate change as well as current exposures to environmental toxins and chemicals is a growing field and we need to be prepared for the forthcoming crises. So we’ve all been subjected to CNN’s poorly informed pundit’s “harrowing” ER experience. From what I can gather, he had a thrombosed hemorrhoid, waited for 40 minutes to be brought back to a room and around 2 hours for pain medications. He sobbed when recounting the event and how unfair it was that he, Glenn Beck, had to wait for medical care. Somehow, this has become a national news sensation and is being touted as an example of how horrible our medical system is. To top it all off, Beck’s hemorrhoids are now ridiculously being likened to the Edith Rodriguez tragedy, who actually died in a L.A. ER waiting room after waiting for hours to be seen. I’m an ER doctor and although I do agree that our health care system is in trouble and is riddled with problems, Glenn Beck’s rectal pain does not showcase any of them. As far as his 40 minute wait time goes, certainly he was in pain and this should be treated as expediently as possible, but I’m sorry to inform the general public that a 40 minute wait is really short! Although our hospitals only have a 15-30 minute wait, most hospitals routinely have 2 hour or longer wait times, sometimes 12 or more hours for less acute issues! It is unfortunate that he had to wait 2 hours for pain medications, but I would assume that in a busy ER, there were likely much more pressing issues from other patients like heart attacks and people trying to die. There are multiple reasons for prolonged wait times in emergency departments. The most common is because of triage protocols. From all of the patients presenting to an ER, we must take the sickest patients back first – strokes, chest pain, active bleeding, respiratory compromise, sepsis (severe infections), etc, come back first. Unfortunately there are many people that present to ERs that do not actually need emergency care and these people must wait for the more acute complaints to be take care of. Bonus rant: These are patients with coughs, colds, rashes, some chronic conditions, and a plethora of other complaints that should be treated by primary care as an outpatient rather than in an emergency department. Some come because they couldn’t get into their primary care doctor or don’t even have one, some come because they didn’t want to wait for primary care, some just want immediate gratification, and some just have noplace else to go. Regardless of the cause, primary care complaints clog up the department so poorly informed pundits screaming in peroneal agony need to wait until the other patients are cleared out. We are actually mandated by law to give a medical screening exam to any patient that presents to the ER, regardless of their complaint, be it emergent, chronic, or completely ridiculous. All this without requesting any information about ability to pay or insurance status, we must see them all. The most frequent abusers of the emergency system tend to be those on our public assistance programs, MediCal here in California. These are “heavy utilizers”, people that choose to go to the ER for even minor complaints, because they know that they can be seen quickly and they don’t have to pay a copay. Now the taxpayers get a $500 ER bill for what would have been a $75 primary care visit. Unfortunately, since there is no personal accountability built into our public health system, there is no incentive to use the system properly. In the same vein, a surprising number of patients utilizing our public health system are smokers, spending the equivalent of a low-cost heath insurance policy on a pack of cigarettes per day (~$150/month) and incurring billions of dollars collectively in smoking related healthcare costs and lost wages. These patients cost the system and the taxpayers a ridiculous amount of money and often will keep other emergency patients from being seen in a timely fashion. The problem with our healthcare system today is not with the physicians, nurses, and other staff, we all strive to give our patients the best care we can considering the circumstances at any given time. We’re there to help, and even though we didn’t sign up to be spit on, cursed at, swung at, vomited on, sprayed with blood and other body fluids, plus have ridiculous lawsuits filed against us, we go to work anyway and try to give some help to whomever comes in, regardless or race, creed, disease state, wimpitude factor, or ability to pay. Many of you have seen Sicko, so you know that insurance companies are a big part of the problem. I think two other major contributors to our healthcare crisis are frivolous lawsuits (often from unreasonable expectation of care), and a lack of personal responsibility from a patient perspective. If insurance coverage is made non-profit, medical liability is reformed, and people have to pay the health costs of their lifestyle choices (ie: smokers pay for smoking related illness costs, obese patients contribute extra to care for cardiac disease and diabetes, etc), we’ll see a significant decrease in cost to everyone and more efficient care. Leaving healthcare up to the free market is a recipe for disaster – right now we outspend every other country in the world by far, yet our health system ranks 37th! How’s that free market working for you?